I received this plate several years ago, but have been unable to determine the original book it came from. The plate itself contains very little information — no artist or engraver. In the upper left is "Vol. 1. pa. 147" - This at least tells me the book is in English and probably published in London. The plate has wide margins and the total size is about 14.5" x 9" (37 x 22 cm). From the anthropomorphic characterizations of the orangutan, ape, and even the serpent, I had assumed the plate was from the 1600s. Recently I was thumbing through Ramona and Desmond Morris' 1966 book, Men and Apes when I spotted a very similar illustration of the Orangutan. This illustration came from Daniel Beeckman. 1718. A Voyage to and from the Island of Borneo, in the East Indies... T. Warner, London. 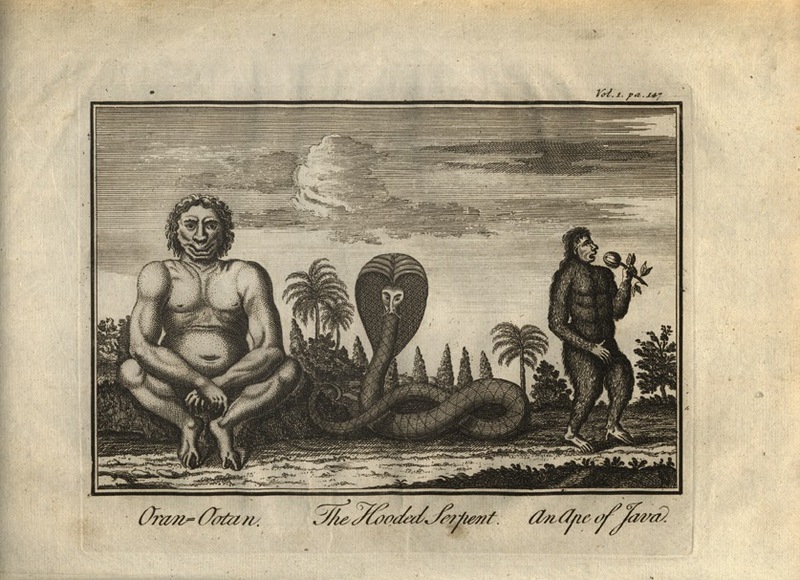 I was able to get a copy of the 1973 reprint of Beeckman's voyage to see if it also included the hooded serpent and Java ape — it doesn't. I do not know if Beeckman's voyage was published in multiple editions - an official report and a popular account. The reprint is of a popular account. So it is possible that the plate I have came from an official report, if one exists. More likely the Beeckman was the original source for the illustration and the copy I have appeared in a later book, perhaps and encyclopedia. blog: A journey Around My Skull. This illustration is from The Royal American Magazine, or Universal Repository of Instruction and Amusement, May, 1774 (They just don't name magazines like they used to...). 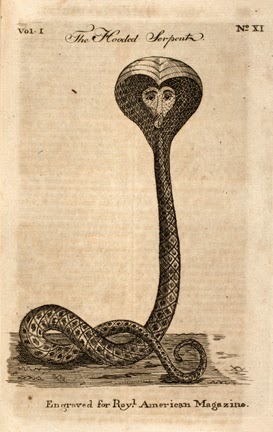 This 1774 illustration lacks some of the detail of the hooded serpent in the plate I have, but is clearly based upon it, or a related copy. Given that the 1774 illustration lacks detail, I would guess that my plate was published between 1718 and 1774. Eventually I hope to discuss the evolution of natural history illustration. This engraving is a good example of the anthropomorphic style from the 17th and early 18th centuries when artists frequently had to illustrate animals from written descriptions, or at best a carcass, or stuffed specimen. I would be most grateful for any comments or insights to the origin of this plate. Note added 1/21/2015: In updating this old blog with the hopes of beginning to add content again I found another version of this same plate on the PrintedPrimate.org website: http://printedprimate.org/2010/02/20/an-ape-of-java-the-hooded-serpent-oranootan/ . The two plates are mirror images of each other and it is clear one has been copies from the other - a direct copy of an engraving would have to be re-engraved thus causing the copy to be a mirror image of the original. I think my copy has slightly more detain, suggesting it is the earlier version, but I honestly don't know. The two plates also have different headings (volume and page number). 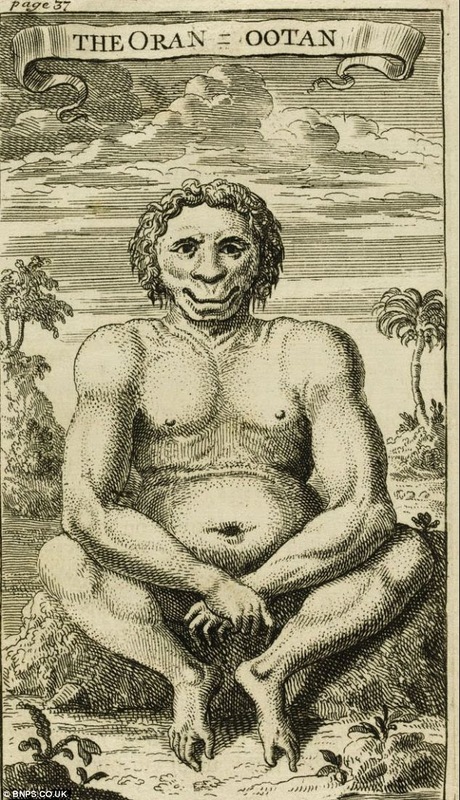 The PrintedPrimate website also has another plate showing the same Ape from Java illustration and it is dated 1752. I believe this 1752 illustration is a later copy of the original, so my new guess for the publication date for this plate is between 1718 and 1752.